The Vaasa region is one of the most export-oriented regions in Finland, yet the city’s port has mostly been used for imports. Now exports are on the rise and according to a recent analysis there is potential for further expansion. The port of Vaasa has the potential to expand operations, particularly by increasing the exports. This is shown in the goods flow analysis carried out within the Midway Alignment framework, a joint project of Vaasa and Umeå. – The analysis confirms our preconceived notions. We are facing a great growth opportunity, but to seize this opportunity we naturally need to work hard, says Port Director Teijo Seppelin. 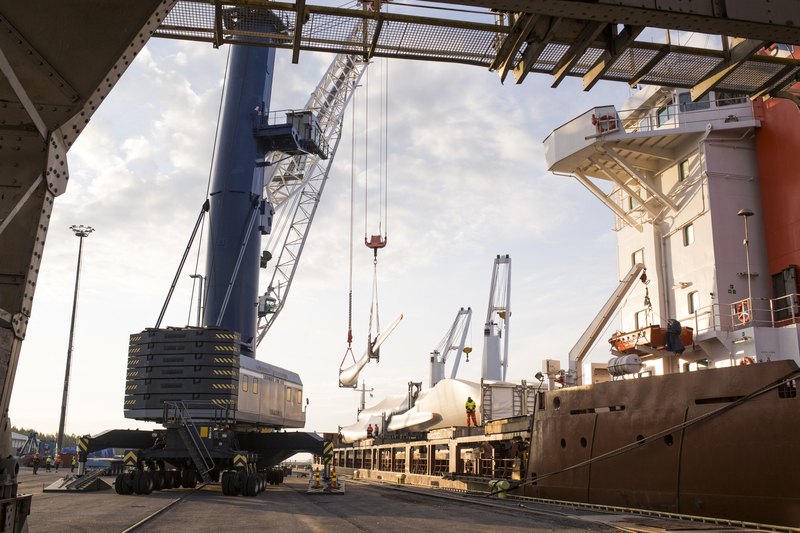 More than 70% of the industrial goods produced in Vaasa are exported, but as it stands, most of it is shipped out of the bigger ports in southern Finland. – There are historical reasons for this state of affairs. During the tax-free era the port in Vaasa was very focused on passenger traffic and therefore the infrastructure for goods transports was underdeveloped, Seppelin explains. Currently a lot of work is being put into improving the infrastructure and the current goods flow analysis is part of that effort. The hard work has already generated results: exports in 2014 are up by 30% compared to the previous year. There are several reasons for this. – The bridge to Vasklot has been strengthened and the port’s lifting capacity and storage facilities have been improved and a new ramp has been built. The contractors responsible for loading and unloading have also invested in new equipment and improved their service, Teijo Seppelin points out. The goods flow analysis shows that there are great opportunities for further increasing exports. By generating different scenarios, it has been possible to determine what measures would increase transports the most. The analysis shows that improving services is the best option. According to the analysis, improved service is more beneficial than for example running the Vaasa- Umeå ferry route more frequently. According to Tomas Sikström, the Strategic Infrastructure Planner at INAB in Umeå, it is more about overall improvement than specific measures. – The whole transport chain needs to run smoothly from start to finish. This means taking into account everything from the equipment in the port, to the schedule of the ferry. We need to improve across the board and co-operate more intensively with the businesses in the field, Sikström says. – We should be able to give a total cost quote to our customers and a comprehensive schedule for the transport. There is a lot to improve in this regard. By synchronising the transport chain Finnish customers could in the future make better use of the transport ships that call at the port of Umeå. In contrast with Vaasa, the port of Umeå offers regular transport routes and the ships are often travelling with a light load on the way back. – If we are to seize this opportunity it is necessary to improve the whole chain to make it a competitive and attractive option for potential customers, Sikström explains. Both Sikström and Seppelin are happy about the fact that the analysis shows that things are moving in the right direction. They are convinced that the close co-operation across the Bothnian Bay and the joint port company of Umeå and Vaasa will strengthen the region as a whole in the future.